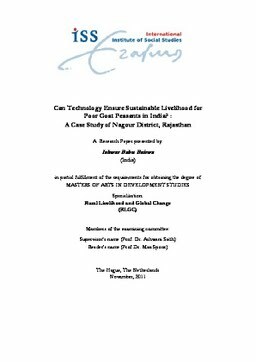 The study assesses determining factors to adopt package of technology among poor rural goat farming communities in Rajasthan state of India. This study used a sustainable livelihood framework and innovation diffusion theory for primary data analysis. The primary data collected with survey, focus group and personal interview research tools in a village of Nagour District. The paper found that adoption of package of technology (Vaccine, Dewormer, Dairy Cattle feed and use of Bradizo-castraor) is influenced by socioeconomic characters, resources and perception of technology. In socioeconomic characters, age, social group, education are key decisive factors to uptake technologies. Middle age group (31-40 years) of goat peasants, other back word cast category and eights standard passed goat peasants adopted four technology package while others adopted zero to three technologies. Moreover, large goat flock size, land ownership and available family’s member of labor for goat grazing are promoting factors to adopt technologies. Perception of technology, for instances, easy to handle, economic advantages, and available local animal health worker are necessarily encouraging factor to adoption of technology. It can derive from field findings that poor resource and weak socio- economic condition of peasants lead to deprivation from technology. On the basis of empirical data, the study concludes goat farming is a potential activity in order to reduce poverty. Today, it requires paying attention of researcher, policy maker, academician, development professions to bring it at centre in development agenda.